For a long time I have used the AWN dock in all of the Linux distros that I use and I like it very much. I really would be lost without it. The only objection I have is that, particularly of the small EeePC 901 screen (8.9"), AWN might just occasionally get in the way. However, I recently posted a nice way to quickly and cleanly get over this problem. Now I remember messing around with Kiba dock some years ago but AWN, at the time, seemed much more what I wanted. Nevertheless, I came across an old Ubuntu thread that actually provided a link to download Kiba-dock in spite of the fact that it's no longer being maintained. 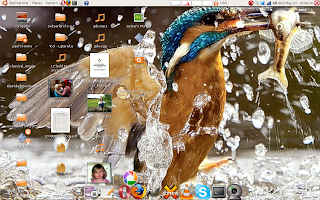 So, I thought I'd try it on the Mac where I'm still using Ubuntu Hardy.And it actually worked very well. Indeed so much so that I'm going to stick with it for a while at least. Kiba-dock is more of a "fun" dock in that you can get the icons to jump and float in what looks like a crazy manner. However, it's still very functional and the only thing I miss up to now is the Dialect applet which allows me to quickly change languages. One other feature that's just a little annoying is that the systray applet needs to be restarted after every boot although maybe it's just that I haven't yet figured out how to get it to start with the kiba-dock itself. A nice feature of Kiba-dock is that you can put a background photo in the dock which doesn't seem to be a feature available in AWN. I also managed to create a situation where no dock at all appeared, just the icons. I like this (see screenshot). I'm not exactly sure why this happened but the photo I used was xyz.png.png Still not clear to me why this should give a photo (apparently, must use a png file to get the background) but it doesn't.